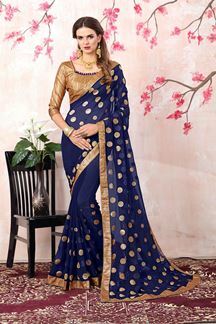 Ooze charisma as you don this euphoric blue designer saree falling plain all along its glossy expanse while a decorative colorful border followed by zari & mirror accentuation runs along the length of saree in a tantalizing finish! This saree comes with matching fabric unstitched blouse. The blouse in this picture is for photo purpose only. Note: Color may slightly vary due to digital photography.